"It's going to be a year of tariff battles"
The French apple harvest has started. 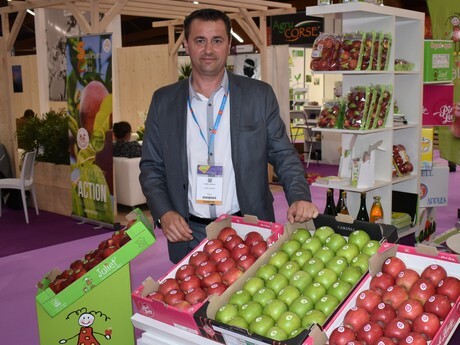 According to Pascal Corbel of Cardell Export, France, it's going to be a year of tariff battles on the apple market. "The harvest of European apples has never reached this high level. We hope to maintain a correct price level, so that the return to orchards is profitable." “We're especially going to have a tough season for common varieties like Granny, Golden, Royal Gala, Red and Braeburn. These are the varieties that are sold on the big export, or with which we compete with everyone." Last season, the European harvest was extremely small. “Prices were high, and everyone was happy, except for those whom did not have enough merchandise. In France we only had 10 percent deficit in volume, and we had a very good season. This year, the other European countries will try to recover, and there will be a big price fight between the different countries." "It’s mainly Italy and Poland that worry us. Poland has a big harvest unlike anything ever before. It's going to have an impact on prices, since Russia is still closed until the end of 2019. As Russia was a big market for Poland, the Poles are offering their fruits everywhere. Even if they are not the same varieties or the same quality, there is a significant price difference that bothers us enormously. Italy is returning to a normal harvest, which will make for a price fight as well. We have to lower our prices to keep competing." Another problem is the German market. "For common varieties, the German market will close for us: the Germans have a fairly large harvest, and will favour their own produce." In contrast to that, the competition with the United States and China will not be too troublesome, provided that the US dollar gets stronger in relation to the Euro. "The United States have a normal harvest, and the Chinese have had a little frost, due to which they will not have a big harvest either." The French harvest of apples is expected to reach 1.5 million tons. "In France, we’re on a normal harvest considering volumes. As for quality, the campaign looks good as well. The product is suitable, but the price level will drop."